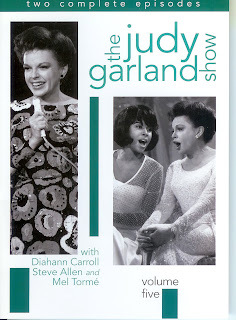 If anyone really wants to sample the full power of Judy Garland at her mature, late period best – a time when her performances could be disconcertingly variable – I suggest they watch the Diahann Carroll episode of the latest installment of Infinity Entertainment Group’s reissue of Garland’s 1963-64 CBS-TV series. She sang all of them, except “Smile,” at her famous Carnegie Hall concert a couple of years earlier, but here, she’s arguably in even better voice, and unlike some of the other musical moments on the TV series, she’s thrillingly present, making each lyric count, with accompanying body language that totally serves the material, and doesn’t simply register as nervous mannerisms. 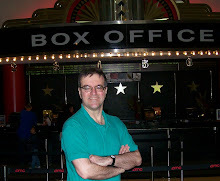 But, in fact, that entire episode, and the Steve Allen/Mel Torme episode which accompanies it, rank high in the series, leading one to regret all the more that the network didn’t allow Garland a shot at a second season, in a less vulnerable time slot than competition to highly-rated “Bonanza” on NBC. The change in her comfort level with the TV cameras is palpable. What’s particularly nice about these two episodes is the array of new (for her) material, all of it delivered with supreme confidence. The Allen show, for instance, has Garland emoting the classic “Here’s That Rainy Day,” and plugging the songs from Allen’s latest musical, “Sophie,” about entertainer Sophie Tucker (Garland's early MGM costar). Allen must have been thrilled to hear Garland sock over the big ballad, “I’ll Show Them All,” as perched on a stool behind her, he looked on with awe. His wife Jayne Meadows joins Garland in the regular “tea” segment, telling an amusing story involving a manhole, and both ladies are in comfortable, chatty form. The “trunk” segment which closes the show presents a straw-hatted Garland at her playful best having a ball with Vernon Duke’s “Island in the West Indies” and then launching into a spectacular, moving reading of Vincent Youmans’ “Through the Years.” Just dazzling. The Carroll show has much going for it, beyond the aforementioned splendid mini-concert. Carroll’s excessive 1960s makeup notwithstanding, the star of “House of Flowers” and “No Strings” looks cute as a button and ridiculously young, warbling “Quiet Nights and Quiet Stars” and “Goody Goody.” She and Garland engage in a dandy medley of tunes by Harold Arlen and Richard Rodgers, one that bears favorable comparison to the famous Barbra Streisand duets on the series. The program concludes with Garland shining in an elaborate new arrangement of “Great Day,” despite a too obtrusive off-stage chorus. Even if you haven’t been collecting the series until now, this exceptional pairing is well worth owning for its own sake. Sylvester Stallone's "The Expendables" trumped "Eat Pray Love" at the box-office this weekend, but the latter still performed solidly with $23.1 million in second place, despite reviews that were decidedly mixed, and a Rotten Tomatoes rating of only 38%. Clearly, the public that made the book a best-seller can't get enough of Elizabeth Gilbert's soul searching globe-trotting memoir. You can read my take at America magazine.